What Happens in a Typical Hunter Class and Tips and Tricks of the Trade on how to Succeed in Them. 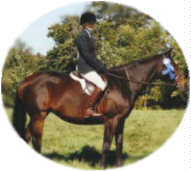 There are usually three to four classes in a typical hunter division, and the over fences classes are usually first with the flat or under saddle class finishing up the division. You or somebody else goes in the ring and completes the course. When he or she comes out you will go in and complete your first round, or first course/class. When you come out the person that just went in before you will go in the ring and do their second course. Then you go in and do your second course, and so forth. That is back-to-back. It is usually done in twos, but it is not uncommon with an uneven number for it to be done in threes. O/F TIPS: Always enter the ring confident. Even if you’re not, look confident. This will make you feel at least a little more confident. Try not to be nervous. I know fully well this is a lot to ask of anybody who is less than very familiar with the show ring, but having a positive attitude will effect your horse for the better. When you have a good round give your horse a pat as you complete your final circle. Don’t goo-goo at him and shout lovingly, "OHHHH! WHAT A GOOD PONY!". That’s a little unreasonable, so save it for outside of the ring. However a good pat on the neck seems to impress the judge for some reason. I don’t know why, but they like seeing it. That won’t mean just because you pat your horse means that you’ll win every time. Come on. Get real, but everybody likes to see a rider publicly praise their animal for a job well done. When you fall off (which does happen to the best of us) retain your dignity. (I really shouldn’t have to tell anybody this, but I have seen it happen, unfortunately.) Don’t get up and scream or kick dirt or in anyway get hysterical. It’s unprofessional. (Crying is different. It’s OK to cry as long as you’re not really losing it with your horse.) Even outside the ring don’t cuss or throw a nit fit. Temper tantrums are not acceptable. People won’t like you anymore if you do. When you’ve fallen, if you can, get back on and calmly walk out of the ring. If you’re seriously hurt DON’T MOVE! The paramedics will be there to help you. An under saddle class (sometimes known as a flat class) is run with everybody in the ring at the same time. Unless it is a hack class there will be no jumping. (Hack classes usually have you jump two fences.) Enter the ring at a walk and track to the left. Once you are in the ring find a good open spot. The ring master will come out and at the judge’s signal will tell you to walk, trot or canter (if the canter is aloud in the class). Do as he/she says unless you know unquestionably that whatever the judge is telling you is illegal for that particular class. The riders will show their horses at all gaits required for the class in both directions. Then when the judge calls, go into the center of the ring and line up side by side with your back to the judge. Make sure the judge can see your number. Ribbons will then be handed out and you will exit the ring. Stay in the ring until all the ribbons are handed out. U/S TIPS: Do not slouch. Ever. You are trying to make a pretty picture and a good impression, and slouching makes it all untidy and almost ugly. You might be waiting in line in the ring for an incredible amount of time and you might be bored out of your tree and all you want to do is go home and soak in a hot bubble bath, but still don’t slouch. You don’t have to be stiff as a board and jammed yourself into the perfect, but uncomfortable position, but stay forward on the saddle and keep your shoulders back and back flat. Despite what people might tell you, if the judge isn’t absent he or she is watching you enter the ring and is judging you even before the announcer says, "All walk. You are now being judged.". When you enter the ring break into the trot and show yourself off. The first impression is always the most important. If you can, be the first to enter the ring in an under saddle class. You tend to get the better spots and the judge gets a better over all first impression. Find a good spot. I’ve seen so many people get trapped in little clumps of horses around the ring. When that happens it is likely that you will be forced into the ring railing, into a jump, or (worst possible scenario) into another horse’s rear end, which is really really scary when you realize that horse has a red ribbon tied to his tail. Another trick of the trade is to put your horse in with certain types of movers. If your horse has beautiful movement and there are other horses in the class with good movement, try to find a spot between two not so good movers. It enhances how well your horse is moving. Same thing if you have a not so great moving horse. 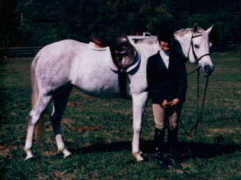 Don’t go and find a spot between the best moving horses in the class because it will make your fair mover look worse. Don’t do anything drastic in front of the judge unless it is completely necessary. Keep your eye on the judge and when he/she isn’t watching you, then make your adjustments. Another reason for keeping your eye on the judge (I mean, don’t stare, but just out of the corner of your eye know where he/she is looking) is to make sure he or she has seen you. If he hasn’t, find an open spot on the opposite side of the ring and make a circle right in front of the judge to make sure he or she takes notice. I remember I had one of the most beautiful under saddle classes ever and I had one of the best movers in the class, but I didn’t get pinned because she didn’t see me. It’s frustrating when that happens. Be aware of the horses around you. If you find you have gotten in behind a spooky horse or just one that’s misbehaving, don’t stay there! When one horse acts up the next will surely follow. Make your revolutions around the ring in an oval or circle. Meaning if there are fences on the rail and you have to track to the inside of them when you get past the last fence don’t move back onto the rail and make your track in a funny peanut shape. The reason for this being especially at the canter is that when you make the turn to the rail you are turning in the opposite direction and your horse is a lot more likely to switch leads on you. Hopes this gives you some help! Enjoy your showing! Now that you know what to do in your class, why don't you click here to find out how to get your horse looking great for it!